Well, that was fun. The Starters discuss everything Lillard including if it was a ‘bad shot’ as Paul George said it was. 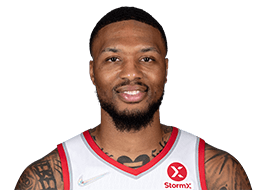 Damian Lillard sinks a legendary game-winning 3 from way downtown, sending Portland to the semifinals and eliminating OKC. HOW ACQUIRED/DRAFT BACKGROUND: Selected by Portland in the first round (sixth pick overall) of the 2012 NBA Draft. 2012-13: Averaged 19.0 points, 3.1 rebounds, 6.5 assists, 0.90 steals and 38.6 minutes in 82 games (all starts) … Kia NBA Rookie of the Year winner, joining Blake Griffin (2011), David Robinson (1990) and Ralph Sampson (1984) as the only players to win the award unanimously … The fourth Trail Blazer to win the award (Roy, 2007; Wicks, 1972; Petrie, 1971) … Joined Oscar Robertson and Allen Iverson as the only rookies in NBA history to record 1,500 points and 500 assists in a season … One of two Trail Blazers to ever finish with 1,500 points and 500 assists in a season (Clyde Drexler-86-87, 91-92) … Broke the all-time NBA rookie record for 3-pointers in a season (185), surpassing Stephen Curry’s 166 3-pointers in 2009-10 … Became the Portland franchise leader for most 3-point field goals in a season, breaking Damon Stoudamire’s record of 181 in 2004-05 … Became the first rookie to lead the NBA in total minutes played (3,167) since Elvin Hayes in 1968-69 … One of 10 NBA players to score 1,500 points … Led all rookies in scoring (19.0 ppg), assists (6.5 apg), field goals (553) and free throws (271) … Ranked second among all rookies in free throw percentage (84.4%), tied for fifth in steals (0.90 spg) and sixth in 3-point percentage (36.8%) … Finished fifth in the NBA in 3-pointers made, 12th in points per game, tied for 16th in assists per contest and tied for 23rd in free throw percentage … Earned Kia NBA Western Conference Rookie of the Month honors for every month, becoming one of just eight players to sweep NBA Rookie of the Month honors since the inaugural award in 1981-82 … Scored in double figures in 76 of 82 games … Tallied double-digit assists in nine contests … Led the team in scoring 26 times and in assists on 50 occasions … Became the first Trail Blazer to win an event at NBA All-Star Weekend, winning the Taco Bell Skills Challenge … Participated in the BBVA Rising Stars Challenge during All-Star weekend and finished with 18 points, three rebounds and five assists in a game-high 28 minutes … In the season opener vs. L.A. Lakers on Oct. 31, joined Oscar Robertson and Allen Iverson as the only players in NBA history with at least 20 points and 10 assists in their NBA debut … His 11 assists tallied in the game opener were the most by an NBA rookie in his first game since Jason Kidd (11) in 1994, and the most by a Trail Blazer in his NBA debut, all-time … Became the first NBA rookie to record 35 points, nine assists and zero turnovers in a game since turnovers became a stat in 1978-79 against San Antonio on March 8 …Made a career-high 15 field goals and a Trail Blazer rookie-record seven 3-pointers Jan. 11 at Golden State, where he finished with 37 points, six rebounds and four assists. COLLEGE: Played in 103 career games (98 starts) over four years with Weber State, averaging 18.8 points (44.6% FG, 39.0% 3-PT, 86.7% FT), 4.3 rebounds, 3.5 assists and 1.25 steals in 32.6 minutes … Finished his career second in school history in career scoring with 1,934 career points, which is also fifth in Big Sky Conference history … Left as Weber State’s career leader in 3-pointers made with 246, free throws made with 520 and free throw percentage at 86.7 percent, the sixth best in Big Sky history … Ranks second in career assists with 362 … Was a two-time Big Sky Conference MVP and earned All-American honors his junior season … 2011-12: Earned All-American honors from the National Association of Basketball Coaches and the Associated Press ... Became the first player in Big Sky Conference history to be named to an All-American team ... Was also named the Big Sky Conference MVP and the District VIII Player of the Year ... Helped lead the Wildcats to a 25-7 overall record and a 14-2 record in Big Sky Conference play ... Finished second in the country with a scoring average of 24.5 points, the best single-season average in Weber State history ... Scored 784 points on the season, which is the most in Weber State single-season history and ranks as the third most in Big Sky Conference single-season history ... Scored a career-high 41 points in leading the Wildcats to a double-overtime win over San Jose State ... Also scored 40 points in a win over Portland State ... Was named Big Sky Player of the Week five times and was also named National Player of the Week in January ... Finished the season 12th in the nation in free throw percentage after shooting 88.7 percent for the season, the third best single-season percentage in Weber State history ... Tied the single-season record for most free throws made with 228 and was fifth in attempts ... Was also 15th in the nation in 3-pointers per game ... Made 94 3-pointers, the most in WSU single-season history and the sixth most in Big Sky history ... 2010-11: Played in just nine games for the Wildcats before suffering a foot injury that forced him to miss the remainder of the season ... Received a medical redshirt season ... Suffered the injury in the second half of Weber State’s game at Tulsa on December 16 ... In his nine games with the Wildcats, averaged 19.7 points and 4.2 rebounds and 3.7 assists per game … 2009-10: Named the 2009-10 Big Sky Conference MVP and earned First Team All-Conference honors for a second year in a row ... Named to the Big Sky Postseason All-Tournament Team ... Earned Honorable Mention All-American honors by the Associated Press ... Named to the United States Basketball Writers Association All-District VIII team and was Second Team All-District VIII on the National Associations of Basketball Coaches team ... Led the Big Sky Conference in overall scoring at 19.9 points per game ... Made 29 straight free throws during a stretch from late November through early December ... Played 50 of the 55 minutes in the 95-93 three overtime win at Idaho State, scoring the winning basket with less than two seconds left in the third overtime … 2008-09: Was a unanimous selection as the Big Sky Freshman of the Year and was named to the Big Sky All-Conference First Team … Became the first freshman to earn All-Conference First Team honors since Rodney Stuckey of Eastern Washington in 2006, and the first true freshman in Big Sky history to earn First Team honors … Became just the third Wildcat ever to earn Freshman of the Year honors … Appeared in all 31 games (26 starts) … Averaged 11.5 points per game, second best on the team and 12th best in the Big Sky … Was third in the conference in free throw percentage (84.1%) and finished ninth in assists at 2.9 per game. HIGH SCHOOL: Played for Coach Orlando Watkins at Oakland High where he was First Team all-league his junior and senior seasons … Averaged just over 28 points per game as a senior with a single-game high of 45 … Averaged 20 points, four rebounds and four assists his junior season.